Cambodia’s Great Tonle Sap Lake sits only 15 km south of town, a unique eco-system and cultural area offering the opportunity to see a different side of the Siem Reap – floating villages, cultural and nature tours, birdwatching. The Tonle Sap Lake is the most prominent feature on the map of Cambodia – a huge dumbbell-shaped body of water stretching across the northwest of the country. In the wet season, the lake is one of the largest freshwater lakes in Asia, swelling to an expansive 12,000 km2. During the dry half of the year it shrinks to as small as 2500 km2, draining into the Tonle Sap River, which meanders southeast, eventually merging with the Mekong River at the ‘chaktomuk’ confluence at Phnom Penh. Tonlé Sap is the largest freshwater lake in South East Asia and is of major importance to Cambodia. The lake expands and shrinks dramatically with the seasons. From November to May, Cambodia’s dry season, the Tonlé Sap drains into the Mekong River at Phnom Penh. 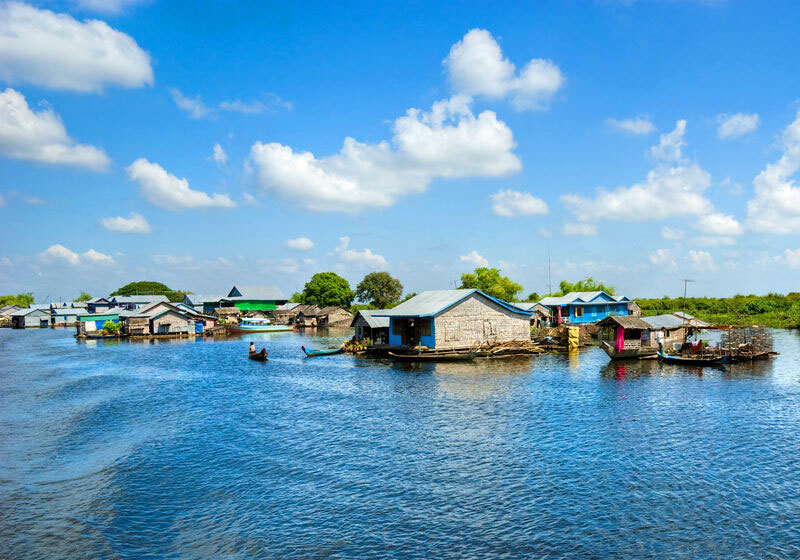 Short Description: Tonlé Sap refers to a seasonally inundated freshwater lake, the Tonlé Sap Lake and an attached river, the 120 km long Tonlé Sap River, that connects the lake to the Mekong River.